move message to mailbox "[Gmail]/All Mail" of account "Gmail"
In recent versions of the mail app, the mail is copied, not moved. This is covered in more detail in the article Making Apple Mail, Gmail, IMAP and AppleScript work together. The solution proposed in the article is to turn off “Show in IMAP” for “All Mail” in Gmail settings, but then some of the good features of Gmail labels get lost. I suggest an alternative solution for using AppleScript to move Gmail-messages, where the original Gmail settings can be kept. One technique can be used to move mail to the archive folder, the other technique can move to any folder. The trick to move to the archive folder is to let the AppleScript invoke the Menu command Message -> Archive (ctrl-cmd-A). end tell --tell application "Mail"
This technique works only for archiving, but sometimes it is required to move to any IMAP folder (or mark with any label if you prefer that terminology). To do this, the first step is to define a rule that moves mail messages. 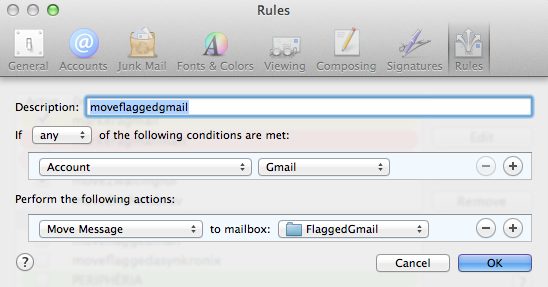 Here is an example of a rule that moves mail from the inbox to a folder named FlaggedGmail (but could be named anything). The folder/label must be created first. 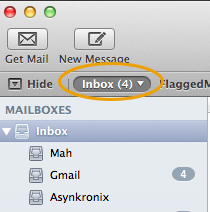 Now everything is prepared for this script that takes all read mail that is also flagged and moves it to FlaggedGmail. Now let’s hope this will work for Yosemite as well! UPDATE: it works on Yosemite.